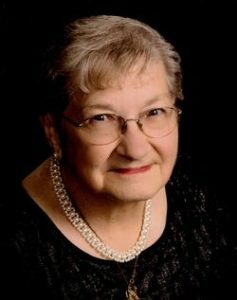 Patricia Catherine (L’Ecuyer) Bartels, 90, of Washington, KS, died May 28, 2017 at her home. Visitation will be Tuesday, May 30, from Noon until 5 p.m. at Ward Funeral Home in Washington. A rosary service will be held at 7:00 p.m., Tuesday, at St. Augustine Catholic Church in Washington. A funeral service will be held at 10:00 a.m., Wednesday, May 31, at St. Augustine. Father Joseph Kieffer will officiate. The pallbearers will be Rob Nold, Shawn Miller, Eric Vacek, Troy Miller, Noah Miller, Ray Fetzer, Landon Livingston, Ty Cecrle, Adam Miller, Mark Rhine, and Taybor Miller. Burial will be in St. Peter & Paul Catholic Cemetery north of Morrowville. Patricia was born January 18, 1927 near Clifton, KS, she was the third child of Patrick and Mary (Kieffer) L’Ecuyer. On December 29, 1945, she married Edward Miller. Together, they lived on a farm outside Morrowville, and their union was blessed with 11 children. After Ed passed on April 12, 1973, she married Leonard Bartels on August 12, 1977. Patricia was an active member of St. Peter and Paul and St. Augustine Catholic Churches. She served as a 4-H Sewing Leader for many years and was a member of several ladies’ quilting clubs. Patricia always helped on the family farm by milking cows, tending a large garden, hauling hay, and raising chickens. After Ed passed, she worked at the Korner Café in Morrowville and then at the Sale Barn Café in Fairbury. She eventually became the owner of the Sale Barn Café where her pies made her famous. Throughout her life, she enjoyed supporting her family at sporting events and social functions. She was preceded in death by her parents; husband, Ed; daughter, Linda Vacek; great-grandsons, Jackson Jueneman and Tanner Miller; great-granddaughter, Jenny Brungardt; sisters, Agnes Miller and Mary LeDuc; and brothers, James, John, and Jerome L’Ecuyer. Survivors include her husband, Leonard; children, Judy Nold, Salina, KS, Jerome (Beverly) Miller, Morrowville, Richard (Vicky) Miller, Morrowville, Patricia (Lanny) Livingston, Mahaska, KS, Christopher Miller, Craig, CO, Anthony (Gina) Miller, Washington, Diana (Dana) Cecrle, Washington, Jane (Dennis) Rhine, Hebron, NE, Matthew (Lori) Miller, Morrowville, and Ed Miller, Morrowvillle; siblings, Patrick (Betty) L’Ecuyer, Morrowville, Evelyn Wassenberg, Marysville, KS, Richard L’Ecuyer, Washington, Martha (Frank) Nutsch, Morrowville, Helen (Linus) Linenberger, Washington, and Bob (Alberta) L’Ecuyer, Morrowville; son-in-law, Alvin Vacek; 43 grandchildren; 70 great-grandchildren; and 3 great-great-grandchildren. A memorial fund has been established and will be designated later. Contributions may be sent in care of Ward Funeral Home.